This week, Paris goes into winter mode. While streets sparkle it is perfect to make the best of Christmas Markets or attend Singin’ in the Rain at the Grand Palais before warming up on heated terraces. Some must-visit Paris venues regularly stage the greatest operas and classical music’s best-loved works. And an Arabian horse lovers calendar would be incomplete without the World Arabian Horse Championship, host by the Salon du Cheval in Paris, where the four-legged stars sparkle, wowing the judges and spectators. Everything is made to make you love staying in Paris and Ile de France! Al Sayed Stud’s LR Era de Excalibur brought the light of a new era to the City of Lights, carefully handled by Tom Schoukens. The Excalibur EA daughter out of LR Expected Beauty repeated her success from the All Nations Cup and garnered Gold World Champion Yearling Filly in Paris, too. Kanz Albidayer is the sire of Silver winner Seranza, owned by Mohammad Sheikh Sulliman. Patricia M. Dempsey’s Million-Dollar-Filly Om El Erodite, by EKS Alihandro achieved Bronze. 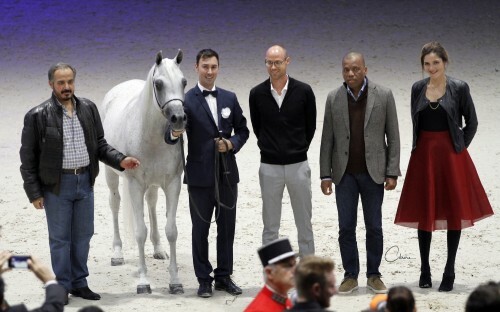 Paris witnessed another reigning Menton and All Nations Cup Gold Champion Junior Filly dancing in the ring to accomplish one more Gold medal. Mozn Albidayer - her timeless beauty, ultra refined and feminine are the keys to her Gold World Champion Junior Filly. Seven out of eight judges voted for the SMA Magic One daughter out of Al Bidayer Stud’s proven broodmare supreme, Mattahari. It was again Tom Schoukens, who led this white beauty to her success. Everything starts with a dream and Madinat Albaydaa, by RFI Farid made her breeder's dream come true, garnering Silver World Champion Junior Filly for Albaydaa Farm, proudly owned by Ahmed Al Talawy. 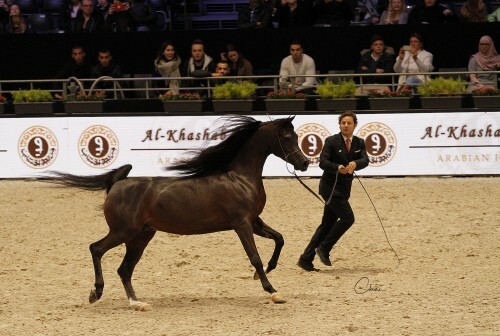 The Bronze winner, Belladonna AT, by Wadee Al Shaqab is bred and owned by Dana Al-Meslemani of Al Thumama Stud. All good things come in threes. No wonder, Tom Schoukens of Schoukens Training Center also handled the Queen of Hearts, Gold World Champion Senior Mare Tehama Ballalina. The glistening white Tehama Na Sidaqa daughter moved from her homeland Zimbabwe to the United Arab Emirates and soon became the Queen of Al Zobair Stud. Thanks to her sweet, people loving character and overall beauty, Tehama Ballalina quickly conquered a fixed place in the hearts of all team members. The WH Justice daughter Shirin By Aisha, bred in Italy and owned by Athbah Stud, accomplished Silver with Al Sayed Stud’s Delight’s Divah RB, by Ajman Moniscione winning Bronze. It was Shirin By Aisha’s stunning son by Wadee Al Shaqab, who not only took the best qualities of his parents but also Gold World Champion Yearling Colt and the highest score of all yearling colts. Bred by Gladich Fausto the steel grey colt, with Giacomo Capacci on the lead, is proudly owned by Al Jassimya Farm. Silver was awarded to the reigning Menton Gold Champion Yearling Colt, HL El Ganador, bred in Chile and proudly owned by Nayla Hayek of Hanaya Stud. Woody Arabians’ RD Harenaado, a Hariry Al Shaqab son bred in the USA, garnered Bronze. When the junior colts were stepping into the championships it was a kind of déjà-vu experience. The reigning All Nations Cup Gold Champion Junior Colt, Alexxander proved that there is nothing impossible to him. Residing in the halls of Al Sayed Stud, young superstar Alexxanderr, sired by Excalibur EA and led by Paolo Capecci, accomplished Unanimous Gold World Champion Junior Colt. What a remarkable day for Khalid and Abdulwahab Alsayed of Al Sayed Stud. The same sire line represents the Silver winning Fuerte, by Shanghai EA, proudly owned by Abhaa Arabians as well as the Bronze winner Nadeem El Arab, by WH Justice, owned by Al Jassimya Farm. The senior stallion championship was an emotional roller coaster ride for Sheikh Hamad Bin Ali Al Thani, representing Al Shaqab Stud. His stallion Wadee Al Shaqab is the reigning Menton Gold Champion Senior Stallion and it was the French Rivera when the bay heir of the legendary sire Marwan Al Shaqab and grandsire Gazal Al Shaqab set his eyes on Paris and a second World Championship with Giacomo Capacci on the lead, a handler, who knows him best. Wadee Al Shaqab did not disappoint; hugs and kisses were flying everywhere. 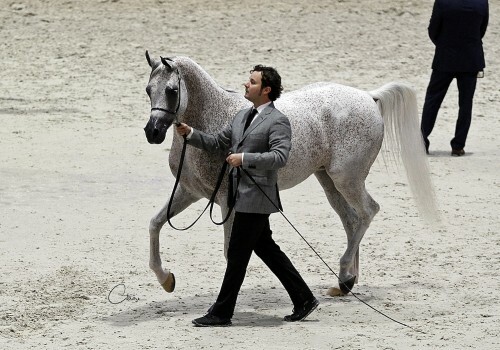 The stallions grandsire Gazal Al Shaqab was honored with the World Platinum Championship later the same day. The competition was a thrill and Equator was a more than deserving Silver World Champion Senior Stallion. Bred and owned by Michalow Stud, the bay Equator represents the Gazal Al Shaqab sire line, too, this time through QR Marc, who is also the proud sire of Bronzer winning Equiborn K.A., bred and owned by Knocke Arabians. An exciting championship day with loads of sparkling stars came to an end. Congratulations to all winners, who were strong today!